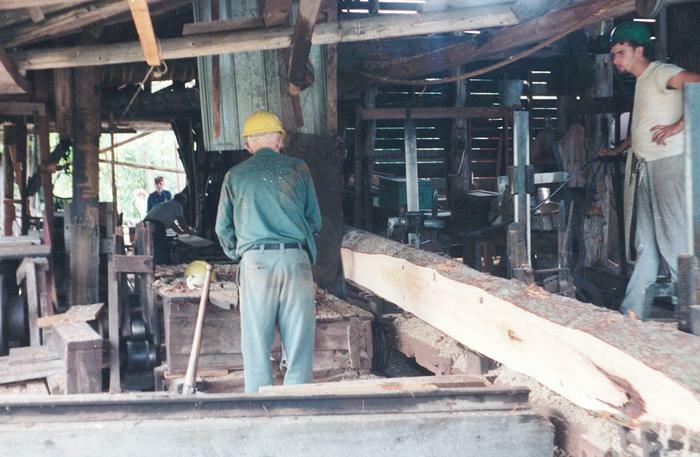 I have been fortunate enough to see the Asam brother's steam powered sawmill when it was still in occasional operation back in 1987. The steam powered sawmill still worked probably much like the original sawmills constructed in the bushes of the hinterland all over Ontario in the great logging days of the area. Most of these sawmills ceased to exist once most of the good lumber was exploited, but a small number of sawmills still remained. 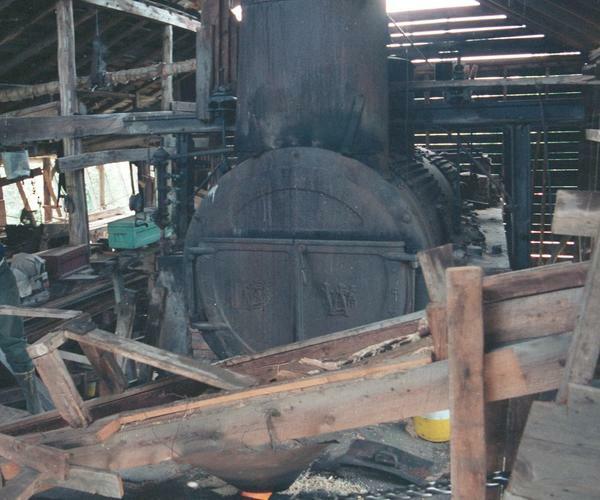 What is interesting about the Asam sawmill was that it was still powered by steam, and, when operated, it was for the primary purpose of milling lumber. 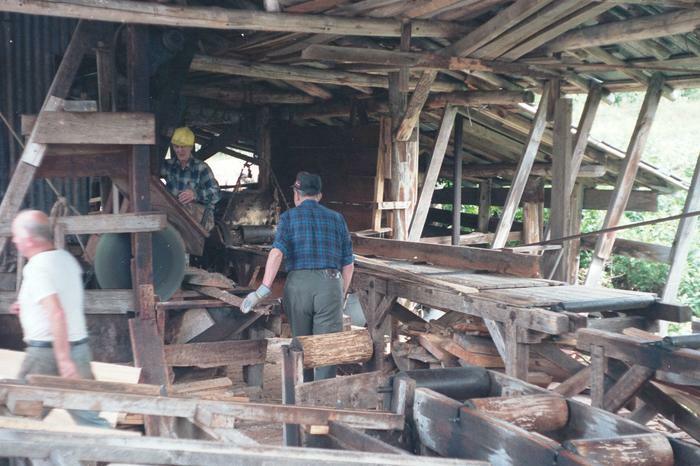 The sawmill was owned by Paul and Shannon Asam. These were two brothers, in their seventies, who had built and operated the sawmill for a long time. They still kept a team of horses for hauling material on the premises. Just like the steam power plant, the horses still did their job as good as they did when they were the only way to do it. The above shot shows the log being moved past the humongous circular saw blade. The man with the hard hat is Shannon Asam, the older of the two brothers. In his left hand he is holding the lever which controls the movement of the carriage. The carriage runs on rails, and moves the log past the circular saw blade. Moving the stick forwards and back engages a series of pulleys and friction wheels which powers a winch which in turn moves the carriage with the log. The other handle close by is the handle for a canthook - an odd shaped hook like tool that is amazingly handy at moving heavy logs around. The black vertical thing in the middle of the shot is a metal screen, designed to catch those coarse shavings that the blade may hurl towards the operator. Note that the operator is not wearing any safety glasses, although he is wearing earplugs. 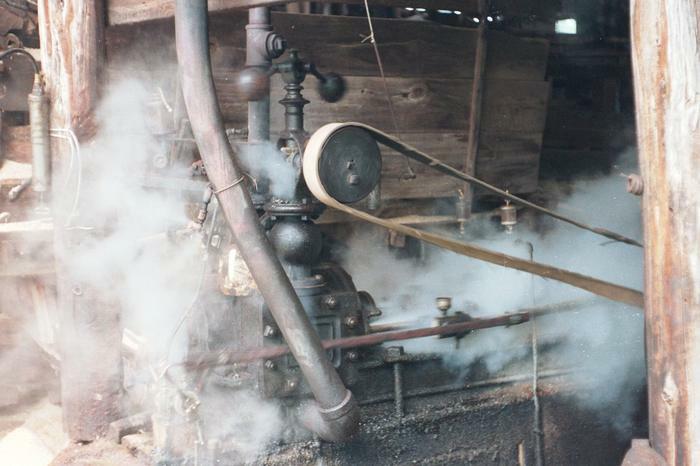 Absolutely every mechanical contraption in the sawmill was powered by a one cylinder steam engine. The shot above shows the cylinder of the engine, with the governor right above it. The shot was taken as a log was passing through the sawmill, so the engine was operating at full power. During idle operation, only a little bit of steam leaked out of it. The pipe going up at an angle is the steam exhaust, where all the steam that didn't leak out went. Steam source is from the pipe behind the governor. The belt attached to the governor goes to another pulley on the main crankshaft. Its there just to power the governor. I always wondered what would happen to the engine if this belt came off. The rod going past the plate on the cylinder is actually only there to operate a little pump that somehow put oil into the engine. The main connecting rod is obscured by all the steam. A grease gun, for further lubrication, can also be seen at the left. Unfortunately, when I took the photos, I was too fascinated by all the spectacular steam, so I snapped the photo when there was lots of steam around. Towards the right, behind the steam, you can barely see part of the huge flywheel of the engine. This is on the crank shaft. Around this flywheel runs a large flat belt to a pulley on the same shaft as the saw blade. Also towards the bottom left, you can see one of the many sawdust transporting conveyor belts. This one catches sawdust from a rip saw for cutting boards to consistent width. The conveyors are nothing but a 15 cm wide flat belt running in a wooden channel at low speed. The two piles of sawdust towards the bottom left are sawdust that missed the conveyors and accumulated on the ground.. This is the boiler providing the steam for the sawmill. The boiler itself was about 1.5 meter in diameter, and several meters long. 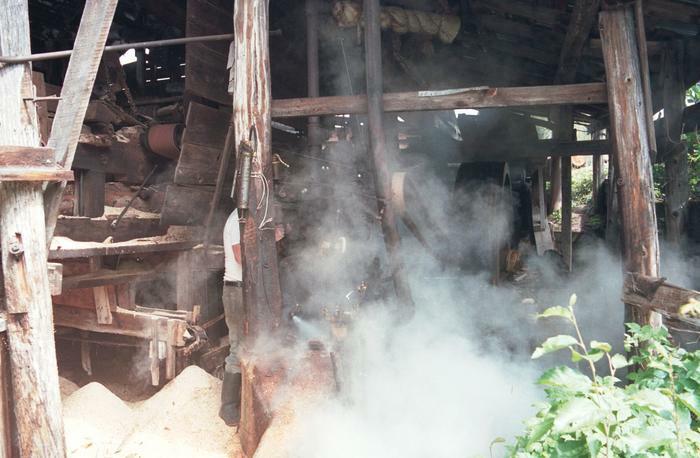 Heat for the boiler is provided by burning the sawdust, as well as slabs from the sawmill. When in full operation, and cutting hardwood, I was told the sawdust was more than enough to run the sawmill with. However, when not cutting very intensively, the slabs were also burned. 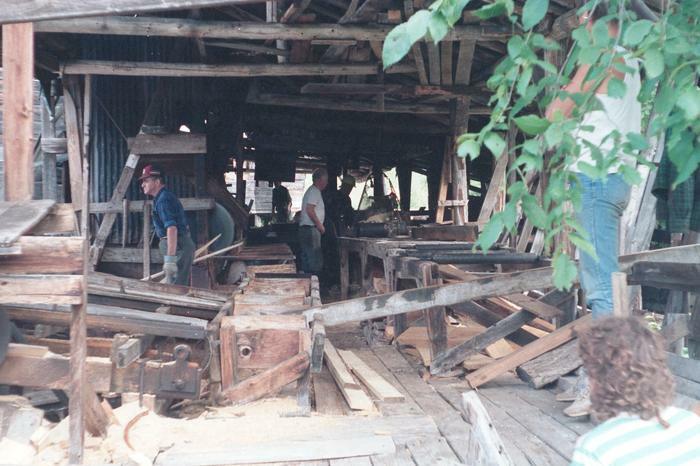 An old circular saw style sawmill like this one produce a lot of sawdust on account of the wide kerf of the sawblade. 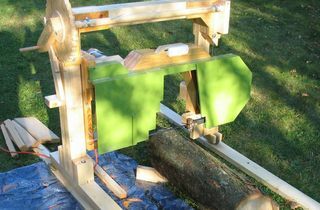 Modern band saw mills can run with a 1/8" kerf or less. With these old sawmills, the kerf was at least 1/4" or more, depending on how much the replaceable teeth on the sawblade were worn back. When they built sawmills like that though, that was as good as you could do, and burning the shavings was a good way to get rid of them. No point in using chipboard or OSB when all you had to do was cut down more trees and mill them. The wooden trough going up at an angle is part of the system that feeds wood scraps and shavings from various parts of the sawmill into the fire box. 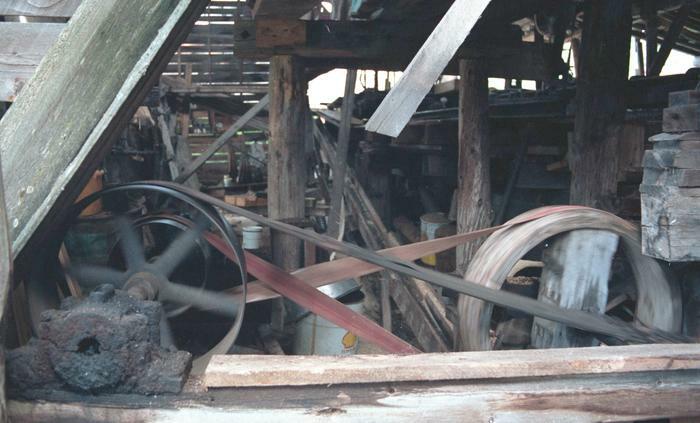 Here's some of the many belts and pulleys that were running throughout the sawmill. Just about everywhere you turned there was something moving, and it was all connected through an elaborate network of pulleys, eventually ending at the steam engine that powered everything. In the middle of this picture, you can see one of the many conveyor belts used to transport sawdust to the boiler. This conveyor took small scraps and sawdust from the cut off saw to the boiler. Here's another view of where the 'boss' works. The log on the right is on the carriage, and you can see the three gadgets for holding the log. These are driven into the log by raising the weighted locking lever and slamming it down onto the log so that the sharp end goes nearly an inch into the log. A metal weight on the locking lever ensures that they don't come loose. The carriage is then moved past the saw blade, and then back. Between cuts, the whole assembly is moved a little closer to the blade. After the first slab and a board are cut off, the log is manually rotated 180 degrees using a canthook, and the process repeated for the other side. Then it is rotated 90 degrees, and boards with clean edges can be cut. Before most of the log is gone, it is rotated another 180 degrees, so that a flat edge is towards the carriage, and the last remaining piece is flat on all sides. Typically, the last piece is left at least 2" thick, so that there is enough wood left to hold it securely for the last cut. The rail on the front is one of about four rails that the logs are initially loaded on to. When a log is completely cut, the carriage is backed up to where the logs are kept, and the next log is manually rolled on to the carriage. There are six people in this photo! I don't know how many people were working (probably more like volunteering) in this sawmill, but there is six people on this photo. This is on the output side of the sawmill, where all the lumber comes from the main sawblade. There are various saws for ripping and cutting boards to length at this side, all powered by the main steam engine, via an extensive network of belts. Also note the complete lack of any sort of safety gear (other than hard hats). I guess this is going back to the days when men relied more on their wits to keep life and limb safe than they do nowadays. In this photo, you can see the cut off saw on the left. This saw was used to cut the slabs into convenient lengths for firewood. A conveyor belt then took the slab pieces and dumped them directly onto a truck for hauling away. The slabs were cut by swinging the large spinning saw blade across them. The saw blade itself was powered with a belt coming from the pivot above it, so that the distance between the sawblade pulley and its driving pulley remained constant. The saw blade, like everything else, was driven with a flat belt, of course. Not a single V belt in the whole sawmill. This is actually very sensible, as flat belts are much more efficient than V belts. Also, flat belts run well on wooden pulleys. In the left foreground, you can see the edges of a contraption for cutting the wood to length. Once placed on the deck, the wood was caught by prongs on a chain (you can just see three of those), and pulled up and past two blades that cut the wood to length. On the right side, towards the back is where the steam engine resides. Lumber coming out of the sawmill This is where the lumber comes out of the sawmill. The rusty truck is where the slabs cut to firewood are loaded. The large pulley above it is the drive pulley which drives a large flat blet that acts as a conveyer belt. Another interesting feature is the end of the building on the left side. This is the building where the boiler is kept (hence the chimney). Even though the steam engine is at the back of the building, the whole building always shook when the mill was in operation. Of the various length of boards below the roof, there was always one that seemed to be in resonance with the current shaking and would vibrate quite visibly. Paul Asam, one of the two brothers who owned the sawmill, said that one time there was a wood pecker family that made the sawmill their home. With all the shaking of the building, he said that when they shut down the sawmill, the chicks were still bobbing their heads back and forth with the rhythm of the sawmill! Considering how poorly such a mill utilized the lumber, and how much man power it took to run, it certainly makes no sense to operate such a sawmill today. 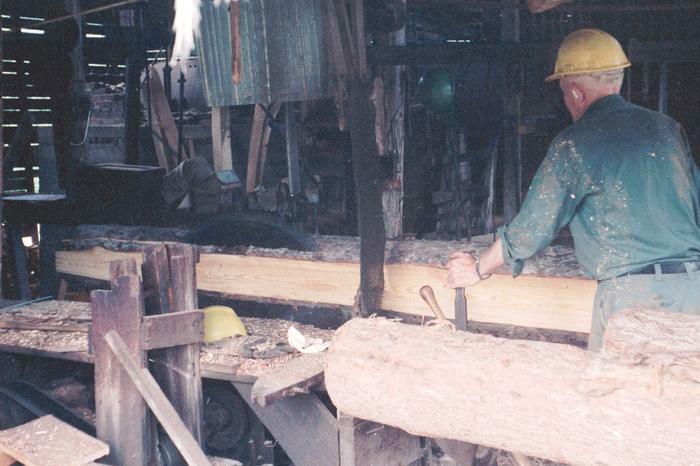 Still, I wish that technology today could be as home made as this sawmill was. 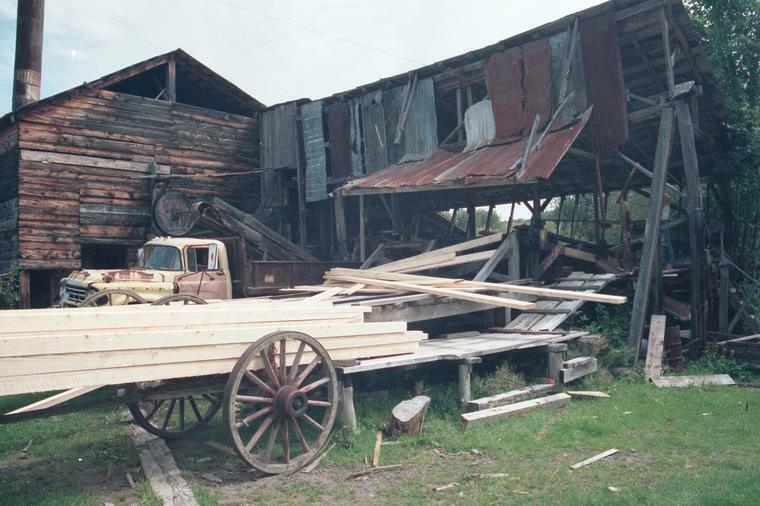 Just about everything in the sawmill was hand made or tinkered in some way, no doubt with a lot of trial and error.